Micromax Unite 2 A106, is the company's response to the budget Moto E. It comes with a 4.7-inch IPS display, quad-core processor with 1 GB RAM and more importantly runs Android 4.4.2 KitKat right out of the box just like the Moto E. Its the first Micromax device to run Google's latest OS. Build-wise there is nothing special unlike the Moto E which comes with Gorilla Glass protection and water repellent coating. But in terms of specs, the Unite 2 wins hands-down. Then it also comes with 20 regional languages support using the Reverie Language pack, which is something that might appeal to people moving from Nokia's feature phones to an Android smartphone. 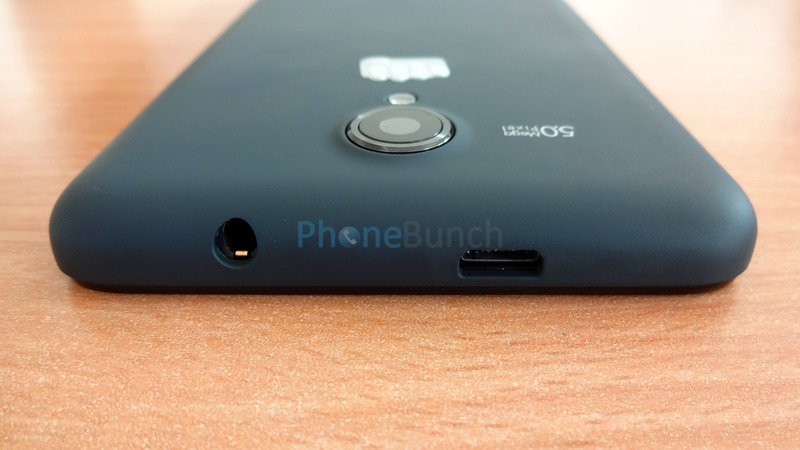 Let's have a look at the device first in our Unboxing of Micromax Unite 2 A106 before we reach any conclusions. 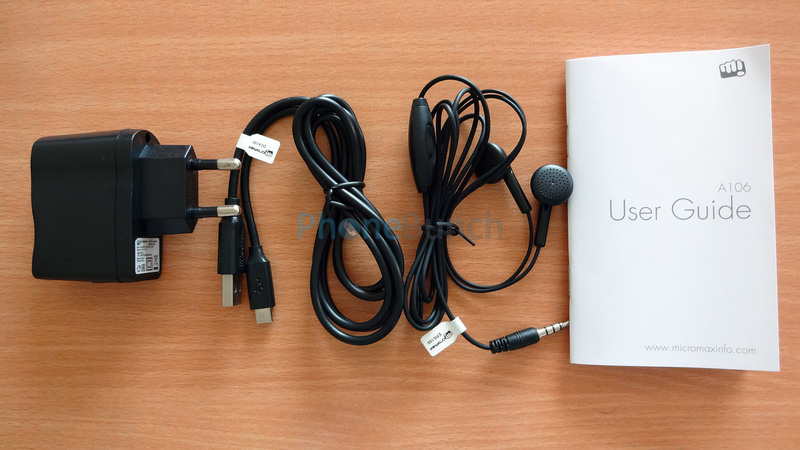 You get the usual accessories in the box including a USB Wall-charger, USB Data-cable, Headset and documentation. There's nothing extra in the box, probably to keep the cost down. All accessories are decent in quality, we will review them thoroughly. The Micromax Unite 2 A106 comes with a 4.7-inch WVGA IPS display which means a pixel density of 199 PPI which is not that bad, but comparing it to the Moto E's 256 PPI on a smaller 4.3-inch display, it might seem a bit pedestrian. But then there's the quad-core MediaTek MT6582M SoC clocked at 1.3 GHz with Mali-400MP2 GPU last seen on the Canvas 2.2 where it performed quite well. There's 1 GB RAM onboard which is plentiful for KitKat alongwith 4 GB internal storage which is expandable using a microSD card upto 32 GB. The display might seem a bit less pixel dense than the Moto E, but it doesn't look pixelated. You also have a 5 MP AF camera at the back with LED Flash alongwith a 2 MP front-facing camera which is a nice surprise. The Unite 2 A106 is a dual-SIM device with 3G connectivity and global roaming on GSM which would be a boon if you are a globe trotter and don't want to carry multiple phones. Connectivity department also includes WiFi b/g/n, Bluetooth 4.0, GPS and FM Radio. There's a Proximity Sensor, Light Sensor as well as an Accelerometer rounding up the sensors department. Now, one of the recent things we have begun to notice in Micromax smartphones in the eye for detail and build quality. Even if these phones are being purchased from some off the shelf Chinese OEM, still this time around some thought is being put into selecting the devices hitting the Indian market. 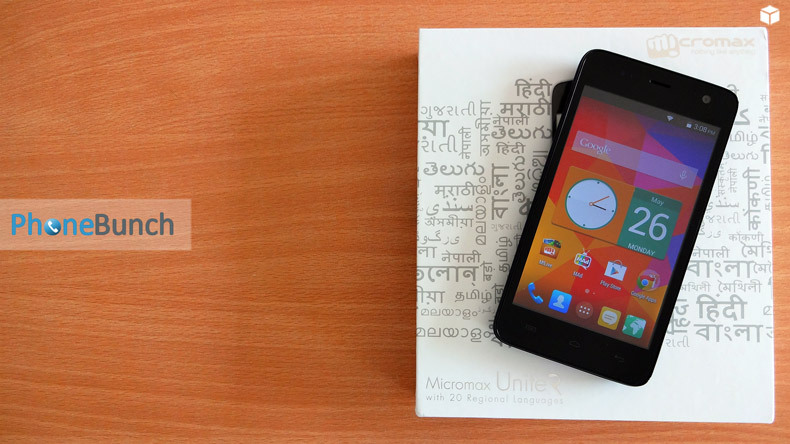 Coming to the Micromax Unite 2 A106, in the front you have the bright 4.7-inch display. We briefly compared it to the Moto E as well in the video, you can see clearly that the Unite 2 has a slightly brighter display. We will talk about color accuracy later. Just below the display you have three backlit capacitive buttons for menu, home and back. But its time that manufacturers switch to on-screen buttons especially with immersive mode now available in KitKat. It would reduce the size of the bezels and make the phone more user-friendly. But the capacitive buttons are sharp and there's no visible light-bleed. At the top of the display there's the 2 MP front-facing camera, proximity and light sensor as well as a notification LED to the left of the earpiece. On the left there's absolutely nothing, just an expanse of dark blue/grey matte plastic while on the right you can find both the volume rocker as well as the power lock/unlock button. Both are dark-blue in color, tastefully designed and are sturdy without any wobbling. Being on the same side, both buttons are reachable with your thumb, making single-handed operation easy. At the back you have a 5 MP auto-focus camera with LED flash just below it. There is no secondary noise cancellation microphone. 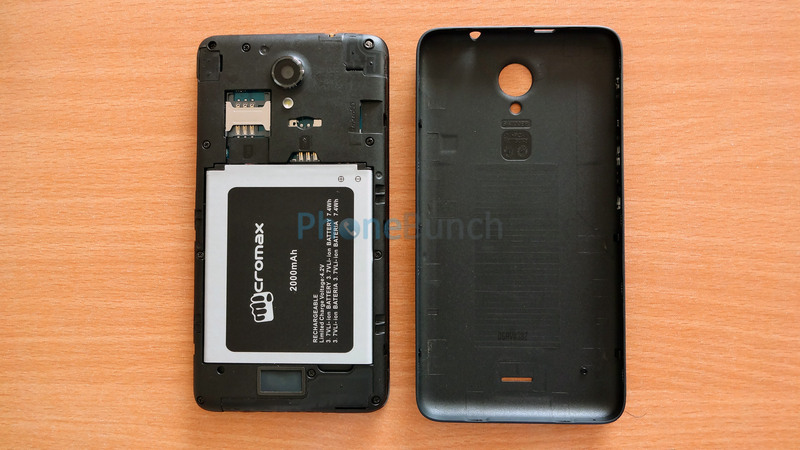 Then the Micromax logo after it, with the speakerphone at the bottom. The back has a matte finish similar to the Canvas 2 Colours and looks really neat. The sides of the phone are rounded making the phone fit easily in your hands with more grip provided by the matte back-cover. There is some weight to the phone as well, but its distributed evenly. On the inside, you will find a regular full-size SIM card slot and a microSIM card slot right next to it. To the side you will find the microSD card slot capable of taking in 32 GB of storage. The battery compartment is just below the SIM slots to house the 2000 mAh unit. Everything is laid out well with no moving parts which is always the right way. The back-cover closes in shut giving the device a unibody sort of look as it envelops the sides, all the while reaching towards the top of the front panel. The sides of the front-panel are glossy and raised a bit to protect the phone from coming in contact with a flat surface. Overall the build of the device is sturdy, there's no flex or creaking anywhere. The Unite 2 feels good to hold in the hand and is easy to grip as well. 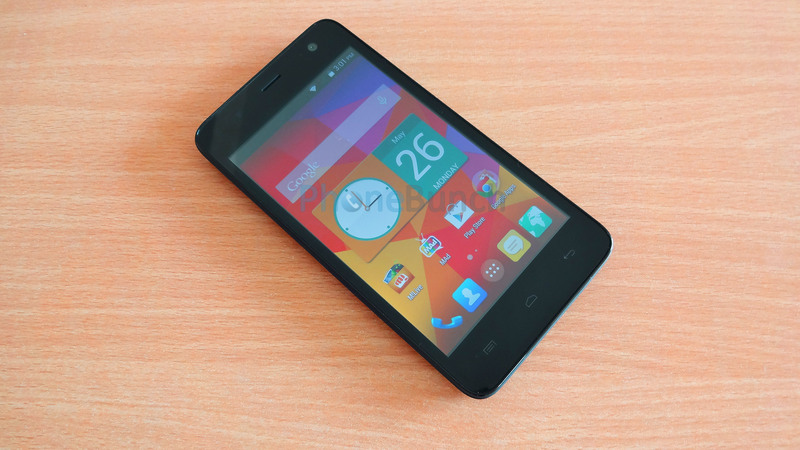 At first glance, the Micromax Unite 2 A106 is an excellent device. Whether its specs, price or build, everything seems to be in place. The display is bright with good viewing angles, there's no flex in the device. The back-cover is matte making the phone easier to grip, the hardware buttons don't wobble. The phone performs well without any lag in the interface. Although we have yet to put it through its paces, its just the unboxing at the moment. Micromax needed to make a big splash in order to get attention away from the Moto E. The Unite 2 A106 is the company's first handset running KitKat and comes with mid-range specs in the entry-level segment. There are no bells and whistles like Moto E's Gorilla Glass 3 protection or Water-repellent coating, but spec-wise you have a quad-core processor, an auto-focus 5 MP camera with flash and a front-facing 2 MP unit as well. Plus there's the 20 regional languages support which is the main focus of the ad campaigns for the Unite 2. The Unite 2 A106 launched at Rs. 7000 is what was needed in the segment to shake things up. If this phone would have launched before the Moto E, it could have easily been priced above Rs. 8000. Therefore, the Moto E is certainly good for the competition and the consumer. What remains to be seen is how the Unite 2 performs in everyday tasks as well as gaming. Till then have a look at our hands-on images.